After recessing the water lines in the wall we put ceramic tiles in the shower and on the wall behind the toilet and sink. A closer view of the tiles. Above: Rueben Brubaker putting the final touches to the solar hot water unit. Middle: Aaron Witmer sitting at the edge of the roof selecting and putting together pipe fittings to connect the system. Below: The finished unit. The cover is temporary until we find the clear glass cover. Hoisting the tanks to the roof. There are three of them. 42 gallons each. Putting the water lines in the wall became a very dirty job. Sonson's face turned white. Danicien is picking away at the wall. Aaron is installing the new hot water line. We are also putting the lines in the wall instead of running them along the face of the wall. The boys and I went to Grande Riviere to help Escotte with his house. He plans on getting married this year. Escotte has been with us for more than 4 years. 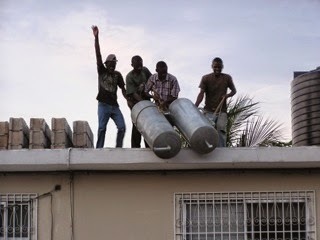 We were able to get the roof on before we came back to Port-au-Prince.